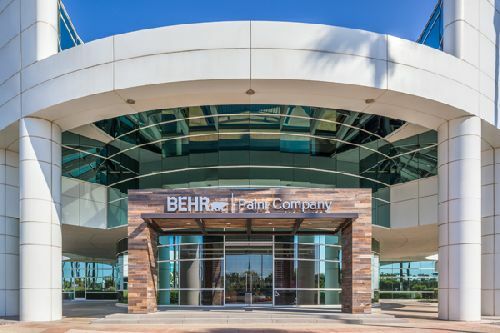 Work was just completed on a new 230k sf, corporate headquarters for Behr Paint Company, one of the nation’s largest suppliers of architectural paint and exterior wood care products. The project was designed by interior architecture and planning firm H. Hendy Associates. 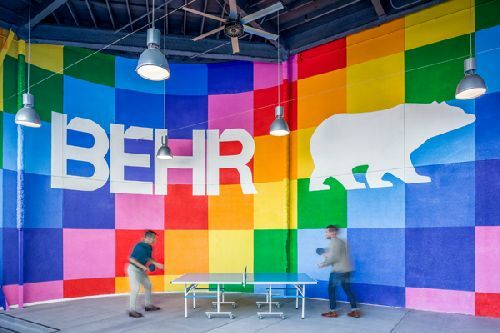 Located in Santa Ana at 1801 E. St. Andrew Place, the new branded-office environment reflects the history and culture of Behr and Kilz paints and primers, supports the company’s growth and inspires existing and new talent. A hallmark of the new space is a 30k sf, state-of-the-art research and development laboratory featuring unique graphics, art and access to natural light. Through Hendy’s creative vision, the Behr and Kilz laboratory has become a vibrant and inspirational space for the company’s R&D team to create unparalleled products and materials. Drawing inspiration from the Behr and Kilz brand history, the office features two historic roads – Pacific Coast Highway and Route 66 – symbolizing Behr’s California roots and Kilz’s origin in St. Louis, Missouri. The routes serve as a gateway to unite employees across brands and departments, and reminds them of the company’s rich past as they continue to move the company forward by building and delivering best-in-class products.